On September 27, I will play a duo concert with laptop musician Per-Anders Nilsson at Brötz in Gothenburg. The concert starts at 8 pm. I have played with Per-Anders on numerous occasions. In May 2005 we did a small tour in California (read more about the tour here). He is a versatile musician with a great interest in using the laptop as an instrument - that is to really the laptop. Consequnetly he has developed techniques to allow him to do exactly that. Improvising musician and EAM-composer. Studied saxophone from 1981-87 at the school of music, Gothenburg where he had several teachers, among them you can mention Jan Garbarek. Nilsson have played with musicians like Willem Breuker, Anthony Braxton and Palle Mikkelborg. He has also played with Karin Krog and John Surman as well as managed his own bands in Göteborg. Currently he works as a teacher in EAM and he is also manager for the Lindblad Studio, at the School of Music, Göteborg University. Has been played at several ICMC: as well as been commissioned at GRM, Paris. 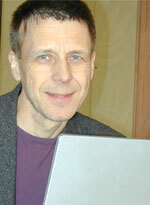 Nilsson was music coordinator for ICMC 2002. Nilsson has released several cd: s since the nineteen80's: the solo cd ‘Random Rhapsody’ in 1993, the group ‘Natural Artefacts’ released a CD in 2001 and spring 04 Nilsson/Sandell Duo released ‘Strings and objects’. The record company is LJ records.